Farmers can increase the crop yield by 15-25% by using just 5 gram bio-fertilizer in one acre. It is completely water soluble, low weight, biodegradable and leaves back no residues. Besides, the best feature is that this product is 100% ‘Made in India’. It is produced and marketed by FIB-SOL Life Technologies, an agri startup incubated in 2015 at IIT Madra. Dr. S. Kavitha and Dr. Anant Raheja are the co-founders. “We both started our respective research to solve production related problems in agriculture. As we had a common goal to improve farm productivity we partnered to develop some unique products,” shares, Dr. S. Kavitha. FIB-SOL Life Technologies have developed low-cost bio fertilizer. It is sold under the brand name N-FIB 20. Company is located at Chennai, Tamil Nadu. N-FIB 20 is a tissue paper like bio-fertilizer carrying nano membrane. “Basically it is a soil bacteria having the power to enrich the soil with necessary nutrients required for the plant growth thereby increasing the yield but it is highly volatile in nature. The strength of our company lies in stabilizing the bacteria and trapping it in the fibre that looks like a tissue paper. So we call it as tissue embedded with bio-actives,” Dr. Kavitha explains the product. 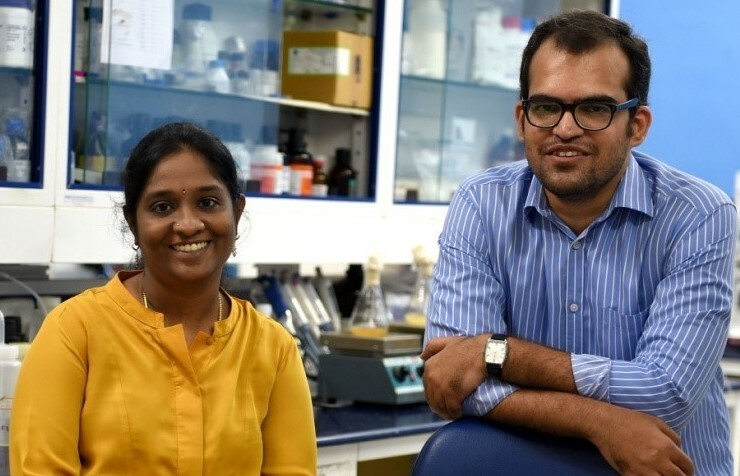 The stamped bacteria is procured from authenticated universities such as Tamil Nadu Agricultural University (TNAU), IIHR Bangalore etc having a signature sequence so that the source of the bacteria can be tracked anytime if required. “After we buy the bacteria, we grow, condense, entrap and stabilize it in the nano frame. It is all done through nano-membrane technology,” she adds. Nano membrane has high surface area that comprises of 100 billion cells per gram. “Due to this property we can condense 500 billion cells in 5 gram, trap and stabilize it in the fibre or tissue. When this tissue is put in 10 litre water tank it easily gets dissolved and becomes sufficient to fertigate one acre farmland,” she elucidates. The field trials have been successful and the product performed very well for all the crops like wheat, tea, soyabean, paddy etc. The product has been validated by third party audits for counts and sturdiness. Speaking of other unique features, Dr. Kavitha elaborates, “With the use of FIB-SOL produced N-FIB 20 in the farmland, the soil is nourished with necessary nitrogen.” Thereby when the soil health is good it is able to provide all the required nutrients to the plants for its growth. Subsequently the plants acquire the strength to resist every pest or disease attack. “However, we don’t claim our product shall make the plants 100% resistant to pest or disease attacks but certainly the soil fertility will improve substantially. Rest is the natural process,” she insists on this detail. The bacteria remain in the soil for a long time thus replenishes the soil fertility continuously. It is 5 gram tissue embedded with bacteria that is safe to be carried in the pocket therefore it saves lot of money on logistics. It certainly leads to 1000 times reduction in storage. “Farmers need not worry about the storage space or travel expenditure. Through this nano-membrane technology we are able to condense 1 kg material into one gram,” she highlights. The shelf life of the tissue is 2 years. The bacteria embedded in the tissue are highly stable and stays unaffected by the adverse climatic conditions. 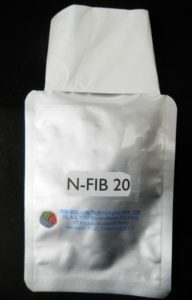 N-FIB 20 is suitable for farmlands have water scarcity or drought conditions. As the product leaves back no residue and it is 100% water soluble it improves porosity and aeration in the soil therefore water required for irrigation is drastically reduced. “In case farmer has no-water in his farm then he can mix N-FIB 20 in 4-5 kg soil and broadcast his entire one acre farm without any use of water!” states Dr. Kavitha. The product is apt for those farmers looking for a transition from chemical to organic farming but worried about the drop in the yield. “If conducive soil pH and organic carbon content is maintained in the field then with the use of N-FIB 20 the crop production will be same or more than the previous yield. In one of our field trials in Punjab, the wheat farmer got the same yield of 400kg/acre from one acre area fed with chemical inputs as well as another one acre trail area where he used only our product. There was no drop in the yield. Farmer will not make a loss with N-FIB 20, we assure the same,” she asserts. At the moment the production capacity of N-FIB 20 is 400 units/month. It is adequate for only 100 acre. Presently it is supplied in customized way for the select clients like tea estate, coffee plantation and large land holders. The dosage of bacteria is calculated as per the crop and then stabilized accordingly for the commercial sales. By the end of 2018, the company plans to increase the production capacity to 20 thousand units and then shall launch in open market. It is expected to be priced reasonable. “Whatever be the price, definitely by using N-FIB 20 farmers using chemical fertilizers can have cumulative profit of minimum Rs. 15 thousand per acre by saving Rs.5 thousand on the money spent on chemical inputs and Rs. 10 thousand earned by selling the increased yield,” Dr. Kavitha reassures. When asked about the reluctance from farmers to use nano technology based products in farming due to previous frauds in this space, Dr. Kavitha clarifies, “We are aware that farmers have been exploited quite a lot in this regard and they have lost the faith therefore we are not in hurry to push our product in the market. We are not concerned about profits instead we want agriculture to boost in the country without any use of poisonous chemicals,” she concludes. Dr. S. Kavitha holds PhD in Biotechnology from IIT Madras and Masters in Medical BioChemistry from Puducherry. Always aspiring to be an entrepreneur she was guided by her mentor to work in the field of agriculture precisely biofertilizers to solve the problems existing in the farmlands. Later she partnered with Dr. Anant Raheja who was also working on biotechnology solutions. Now as their developed technology is standardized and product is validated they want to serve large base of farmers in the country.